In January, attorneys Albert Lechner along with Terrell Hogan and Yegelwel founder, Jim Terrell, teamed up to win a $197,500 jury verdict for their client, Tommy, in a challenging auto accident case. The at-fault party’s insurance company, Geico, offered $35,000 to settle the case before trial. On April 2, 2016, 33-year-old Tommy was heading Northbound on US 1 in St. Augustine on a rainy morning when the driver behind him attempted to pass his Silverado, lost control of her vehicle and hit him from behind. This caused his truck to spin out of control, land in the median and overturn several times. 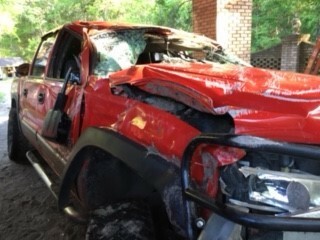 Tommy’s truck crossed the both Southbound lanes of US 1 and landed on the shoulder, facing oncoming traffic. A self-employed army veteran, Tommy was left with severe lower back injuries and chronic lower pain. A big challenge in this case: Tommy’s extensive preexisting conditions. Namely, lower back pain stemming from a series of accidents including a motorcycle crash, a snowboarding fall from a cliff that put him in a coma and left him with a traumatic brain injury, and two flipped race cars. The at-fault driver’s insurance company presented medical imaging at trial that showed Tommy had extensive spine degeneration before the automobile crash. 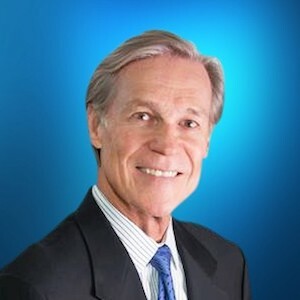 Albert and Jim overcame these challenges by having their client examined by orthopedic specialist, Dr. Paul Shirley, one of the most effective medical witnesses ever. Dr. Shirley thoroughly reviewed Tommy’s past medical records, and explained to the jury how trauma can permanently aggravate a preexisting condition. Additionally, they asked the court to allow a “jury view” of the Tommy’s truck. They felt photographs would not adequately convey to the jury the forces involved in the crash, so they had the truck towed to the courthouse parking lot. During a recess, the jury, judge, court reporter, bailiff, the parties, and their attorneys adjourned to the parking lot. 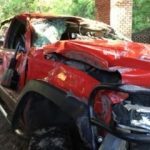 The crumpled vehicle spoke volumes as to the trauma Tommy’s body must have experienced as his truck flipped and rolled down the highway and through the median. 44 years ago, Jim Terrell founded our firm on the ideals that thorough preparation and hard work are the keys to ensuring every case receives its due justice. Those principles remain constant today; they helped Jim and Albert obtain a favorable result for their client, despite his significant preexisting conditions. Consumers are sometimes tempted to accept an insurance company’s first offer to settle their claim, without consulting with an auto accident attorney first. Often, they do not consider future medical bills and other damages they may experience from their injuries later in life. Automobile accidents happen every day and range from minor fender benders to crashes involving major injury or death. If you have been injured in an auto accident, it is important to consult with an experienced auto accident attorney who has the resources to vigorously pursue justice on your behalf, which includes pursing your case in civil court. Consider contacting attorney Albert Lechner for a free consultation.